Address including Town you need cleaning done in? Date or Dates you may want your cleaning done? Texting is the best way and fastest way to communicate with me as your information is there and I can respond with accurate information you send me from above. We try to make your carpet cleaning experience as easy as possible. The more information you can give makes it easier for me to help you! We look forward to hearing from you! Please feel free to Text anytime with any other questions or concerns you may have! If you choose to call please remember we are a family run company and we try to keep our Hours of answering calls between 8:30 AM and 5:00 PM: I will try to answer text messages as I receive and able to communicate. 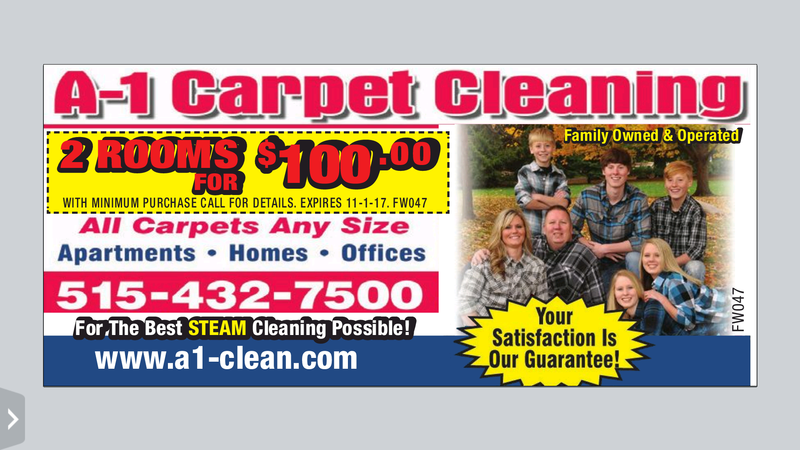 Save $10.00 on your next cleaning by adding us on facebook! Just $50.00 per room after 1st room up to 150 square feet per room. Extremely soiled carpets will cost more!! • Prices above are to help budget your cleaning. Price Match Guarantee! Steam Clean competitors only. Don't sacrifice Quality for Price! 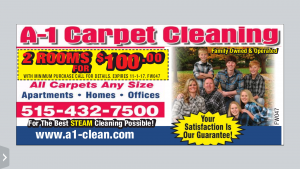 We accept steam clean competitors' coupons!! • Our prices may change due to circumstances per job. We try to keep our prices affordable for all and we will work with our customers on payment if needed. • A-1 is making affordable cleaning for a healthier living.